Hello everyone, my name is Abigail and I'm new in the world of the violin, so, I'm kind of lost & I would truly appreciate your help. Recently, my grandfather gave me his violin, according to him it's a 1920's french violin, copy of a Stradivarius 1716 but the label inside doesn't say the name of who made it, which is a pity because I would really like to know it's origins. How can I remove that sticky part on the violin? The low bridge is affecting the violin's power? making it sound without potency? Thereisn't any expert on violins in my city, so I would truly truly appreciate your help! thank you! pd: if you need photos i can upload some, thank you! Is the sound post in place and are the strings old or new and what kind of strings? Did your grandfather play bluegrass or folk music? Some people who play that style of music intentionally shave down the bridge to make it easier to play faster and do double stops. I did it too on both of mine and they're both quite loud and bright. It bends to the left, I think, or maybe is my sensation. I believe the strings are old, since no one played in a long time, also, the bow hasn't been rehaired but it is in good conditions. I know that my technique is very poor, can this be one of the causes for it's powerless sound? thank you! Hi fiddle chick, he played Tango music, I don't know if it's related somehow. A lower bridge causes a loud and bright sound in every violin? if so, the cause for the dark and powerless sound most be something else. Thanks! The sound post and old strings will definitely cause the violin to sound dead. I suggest using Pro-Arte. http://fiddlershop.com/strings.....nsion.html These strings are very reasonably priced and sound excellent. The sound post must be straight. If you cannot set it yourself most music stores that sell violins should be able to set it for you. To clean the violin use a microfiber cloth and a violin cleaner then a polish. D not try to fix the varnish. It looks wonderful as it is. I looked at the picture of your sound post and it is very far off from where it should be. 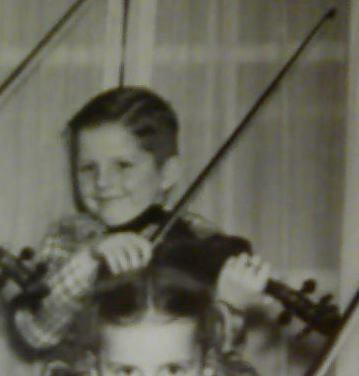 Can you show us some more pic of the violin? It looks like it is a real beauty. I've got to agree with @Kevin M.
The sound post looks very out of position. That would effect the sound of the violin greatly. If you had that fixed and fitted the strings that Kevin suggested, or similar, there would most likely be a great improvement in the sound of the violin. Unless my eye's are deceiving me, it looks like the sound post need's to be moved forward at the top and the bridge need's straightening, it's not a very good fit on the bridge feet to the top of the violin. Bridge seems to lean forward a good bit. A new sound post and bridge are in order, in my opinion. It's probably never had a new post put in, or bridge for that matter. Thanks Kevin M., Ferret and Fiddlestix, I will try to use Pro-Arte (I saw the video, it sounds great). I guess I'll have to take it to a luthier, it clearly needs to be set up by an expert, because of the sound post and the bridge.Thank you so much for your help! What a beautiful violin. The opaque texture should polish out but it adds to it's character. The defect is from a chin rest, which is missing. This will in no way effect the sound. She's a keeper alright,, a real treasure and Kevin is right about adding character to the violin. She certainly deserve's loving care. Oh btw, welcome to the forum. You're right, it's such a beauty. Can't wait to see it with new strings and well adjusted. That's right Kevin, I don't have the chin rest, it's a pity. Thank you for your welcome and replies! Where do you live Carmellina1129? Maybe you live close to a member who can look at it. One never knows. It's a very nice looking fiddle. Yes, you will get more power if the bridge is taller, but the height and shape of the bridge are determined by the fingerboard. I mean the strings have to be the proper heights above the fingerboard, or it becomes less playable. The bridge looks very stout. If you were to thin it, that might make a difference in the sound. I would think that if the feet of the bridge are set on top of rosin deposits, that would damp the sound. Yes, new strings could make a big difference. I think the biggest improvement might come from adjusting the soundpost. The gap between the soundpost and the treble foot of the bridge should be something like 5 mm, edge to edge. In short, you might get a very nice sound after giving the setup some attention. You can, on your own, fix all the things I mentioned, if you want to study up on them. If you take it to a pro, I expect it could be $30 to $80, not including strings, depending on how much work is put into it. If you live near me bring it over and I'll set it up for you or maybe mail it to me. That is a GREAT offer Carmellina1129. Shipping a violin doesn't cost all that much via USPS. The hardest part is finding a good box and stuffing. Thank you Fiddlerman, Kevin M. and RosinedUp for the reply! RosinedUp: thank you for your help, every time I play i feel the strings very easy to play because of the lower bridge, but as you say, I should get a taller and well-shaped bridge, and fix the sound post. I already bought a set of new strings (Pro Arté). I think that I'm going to look for a luthier near Buenos Aires, I will definitely invest time and money on this beautiful violin, everytime I play him I fall in love all over again. Thank you so muchofor your answers once again, this is an amazing forum!